After reading an advertisement in the mail about discounted rates for seniors 65 and older to take classes at Schoolcraft, Livonia resident Diane Luty jumped on the opportunity. To her surprise, two and a half years later she completed the Music Foundations program with a 3.874 GPA. She will be walking to receive her certificate this May. Most anyone would be impressed with a final GPA as high as hers, but for Luty, it took more than just showing up to class. Born visually impaired, Luty never thought she would attend college courses, let alone complete a college program. “My parents never put any big expectations on me because of my eyes. As long as I got a C [at Bentley High School in Livonia], they were happy,” said Luty. Though she originally aspired to attend nursing school, she was worried that her eyesight would limit her from succeeding. Instead, she took on the average housewife identity and had two children, a son and a daughter. Luty had been interested in music from a young age, but never thought she would pursue it as anything other than a hobby. She was in her high school choir, church choir, and has been the bell choir director at Memorial Church of Christ in Livonia for over ten years, along with singing for funerals. Her courage and perserverence were an integral of Diane Luty’s success at Schoolcraft. Despite her visual disability, she successfully completed the Music Foundations Program Certificate with a 3.874 GPA. When coming across the opportunity to attend Schoolcraft for a discounted rate, Luty called the counseling office right away. She asked all about the Music Foundations Program and was excited to begin the program, but the one class that worried her was Music Technology. Despite her worries, she began classes in January 2012 in an effort to complete the one-year certificate. Since she had never been to college and had not attended school in years, she had no idea what to expect. “I will just jump in gentle. If it goes, it goes,” said Luty. Her first term consisted of Class Piano with Professor Janice Derian and Voice with Dr. Linda Meehan. Though she needed some special accommodations, such as a piano book printed on 11 x 17 inch paper bound by single chapters so that she could read it, she performed extremely well. To her pleasant surprise, she received a 4.0 for her first term. For her second semester, which was in the spring, she took Music Appreciation, a required course to complete the degree, and Music for Elementary Teachers, one of the several electives one can choose from to complete the degree, with Dr. Fred Moss. She also sung in the Tuesday night choir with Dr. Jonathon Drake. “Him and I clicked right away. It was a joy to have him as a professor,” said Luty about Moss, who is also legally blind. “It was really interesting to see his way of teaching. You always had to email assignments to him, and his computer would talk to him. Of all my professors, he was probably the most organized I’ve ever had. He was an inspiration by being in his class,” said Luty. For her third term, Luty had to take the required Music Technology course that she had been dreading along with another voice class. While Luty was able to adapt the Music Technology program in which one can write music on a computer, Logic Pro, to where she could see it, it was difficult for her to keep up with the class. Normally, students could see the entire soundboard on the screen. 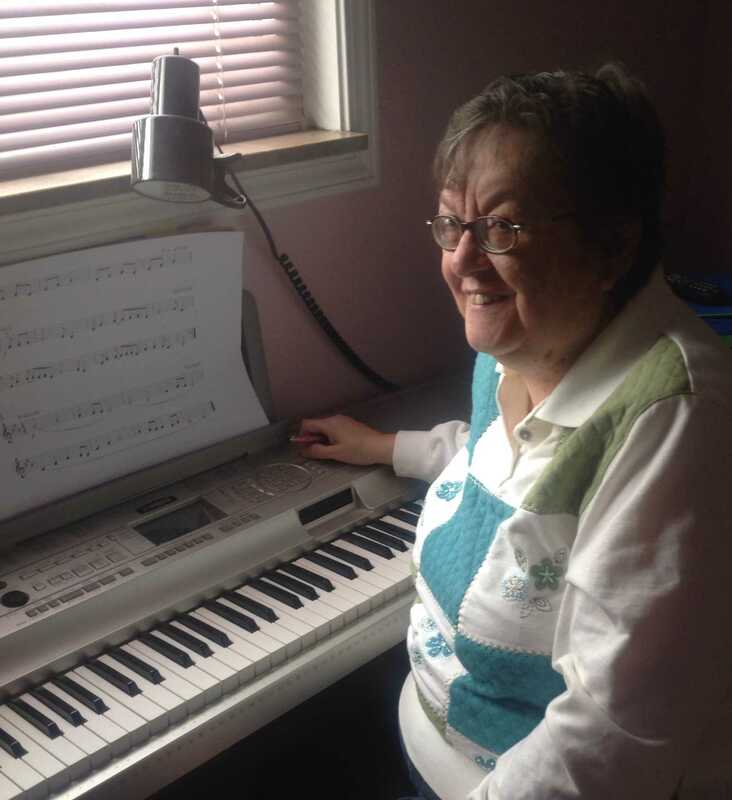 Because of her poor eyesight, she could only view about a quarter of the soundboard at a time, causing her to have to “scroll up and down and back and forth” all the time. “By the time I would find it, he [Dr. Barton Polot] was three steps ahead of me,” said Luty. Because she was struggling and frustrated with the course, she withdrew. She maintained a 4.0 up to this point and did not want this course to demolish her overall GPA. By the summer of 2013, Luty had completed all of the required classes for her degree other than Music Technology. She prepared herself with an adaptive keyboard and a hat that resembled a miner’s helmet with a magnifying glass attached, then re-registered for the course for the fall 2013 semester. “On the first day of school, I was going to give it my best shot. All I needed was a 2.0. I figured that wouldn’t ruin my GPA too much,” said Luty. Dr. Polot noticed that she remembered lots of the material from when she first took the course. After a meeting between Polot and Luty on a Tuesday before class, she was introduced to an iPad. Though she had seen one before, she was not very familiar with the software it provided, but she knew that a lot of blind people use Apple products. The iPad was equipped with Garage Band, a program similar to Logic Pro with some limitations. Polot gave her the opportunity to have an independent study period in which a student assistant helped her work once a week with the Garage Band program in order to complete assignments. At first, assignments consisted of making a tune with a rhythm and a harmony line, and more expectations arose throughout the course. Luty was pleased to end up with a 3.7 in the Music Technology course, which was much better than she ever expected. Now that Luty has completed the entire Music Foundations Program at a college level, something she never expected to achieve, she is planning to use the knowledge gained from her experience to give back. She would like to create a traveling music program that sings at local assisted living and nursing homes. “Music, no matter how old or senile the mind may get, will always reach them somehow,” said Luty. Luty also hopes to inspire young people, especially ones with disabilities, to continue going to school or go back to school. “I’ve never driven a car and have always had to make arrangements, but I haven’t lived under a rock my whole life. I think people need to know you aren’t handicapped, you’re handi-capable. Be your own advocate,” said Luty.